If you like trying new products and can afford it, I&apos;m generally bullish on subscription boxes. They&apos;re relatively inexpensive and typically contain products with a total value in excess of the cost. It&apos;s a nice treat to have goodies delivered to your door and of course if you choose the right type of box, useful. Pregnancy, especially for first-time moms, is one of the most significant times a woman will research and try new products for both herself and her baby. Not surprisingly, there&apos;s a subscription box for that! 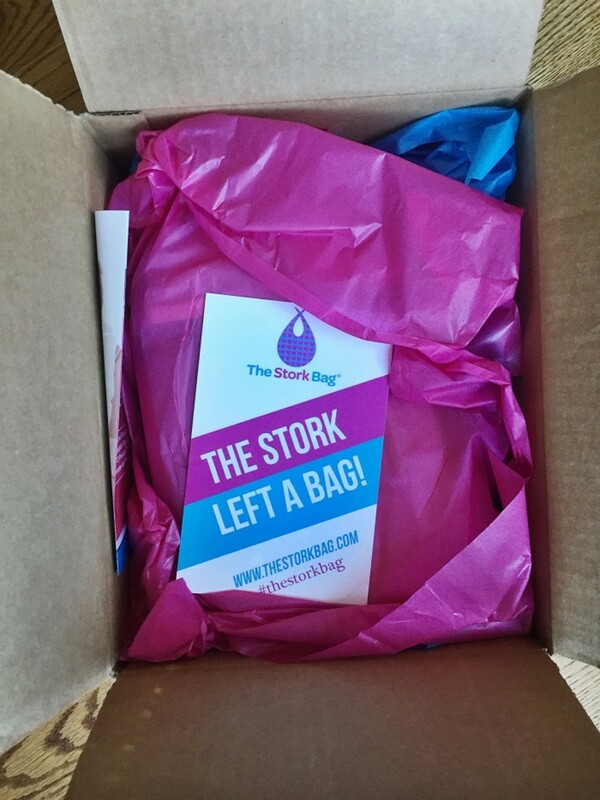 A sample of the 1st Trimester Stork Bag arrived on my doorstep earlier today, as matter of fact. From the website: This bag contains items specifically geared toward your first trimester of pregnancy. The bags are “surprise bags” which is why we do not disclose what is in the bag before it arrives but some examples of items your bag might include morning sickness aides, prenatal vitamins, health and beauty items, pregnancy book/journal, etc. The cost of a 1st Trimester Stork Bag is $45, as are the 2nd and 3rd-trimester bags. My first impression is that the items are packed well and the bag/box are pretty but while the Stork Bags are touted as being reusable and technically could be, I&apos;m not sure what I would ever use it for. I&apos;m more likely to toss it, honestly. The samples I received in my Stork Bag include a water bottle (with "You Are Strong, The Stork Bag" inscribed on it), Crystal Collagen Gold Powder Eye Mask, Aleva Naturals Bamboo Baby Sensitive Wipes, Preggie Pop Drops, HappyMama Prenatal Probiotic Supplement, and an Earth Mama Angel Baby Organics Morning Wellness Tea Bag. That&apos;s 7 items. I&apos;m not sure if I received a media package with samples or if this is the real deal but I have a hard time believing these small samples are worth $45. I don&apos;t need another water bottle, no less one with the company&apos;s name written across, and 1 tea bag and 1 Preggie Pop Drop are nice to try but not exactly a draw. I&apos;m a big fan of HappyMama and the 15 packets of the Probiotic Supplement are cool, as are the baby wipes (I&apos;ve never seen or hear of the brand so it&apos;s nice to try them). My favorite of the products is the Crystal Collagen Gold Powder Eye Mask, not surprisingly. While pregnant, that&apos;s the exact kind of treat I&apos;m looking for. 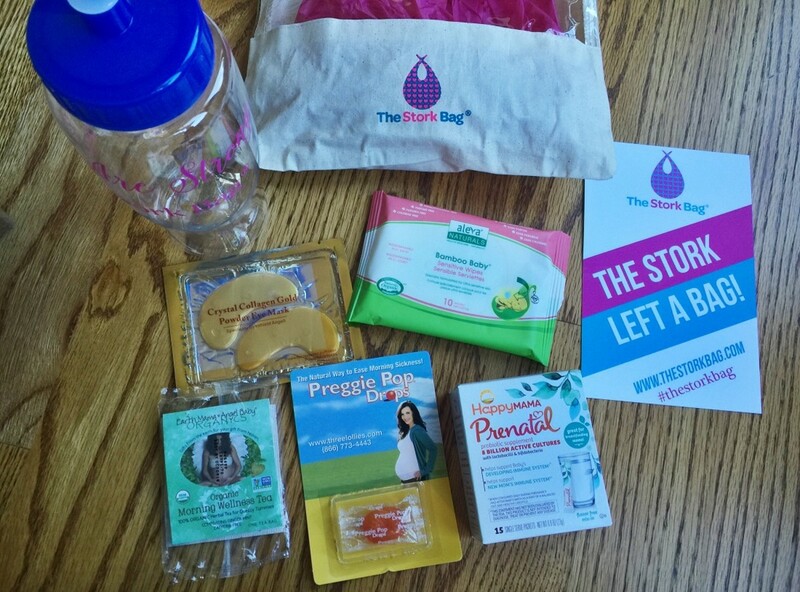 I love the idea of the Stork Bag and think it has the potential to make a great gift. There&apos;s room for improvement in both value and content, though.